Published Nov 17, 2016 by Prentice Hall. Part of the LiveLessons series. In this lesson, you will learn how to use Java FX to create layouts, handle mouse events, and other advanced FX features. In this lesson, you will learn how to draw graphics and play media using Java FX. In this lesson, you will learn to use JPA for accessing, persisting, and managing data between Java objects / classes and a relational database. In this lesson, you will learn to use JSF to create multi-tier web applications. In this lesson, you will learn to use advanced JSF features to connect a database to your JSF web application. In this lesson you will learn to build web services in Java using both SOAP and REST-based protocols. 40+ hours of video instruction. Written for programmers with a background in high-level language programming, this LiveLesson applies the Deitel signature live-code approach to teaching programming and explores the Java™ language and Java™ APIs in depth. The LiveLesson presents concepts in the context of fully tested programs, not code fragments. 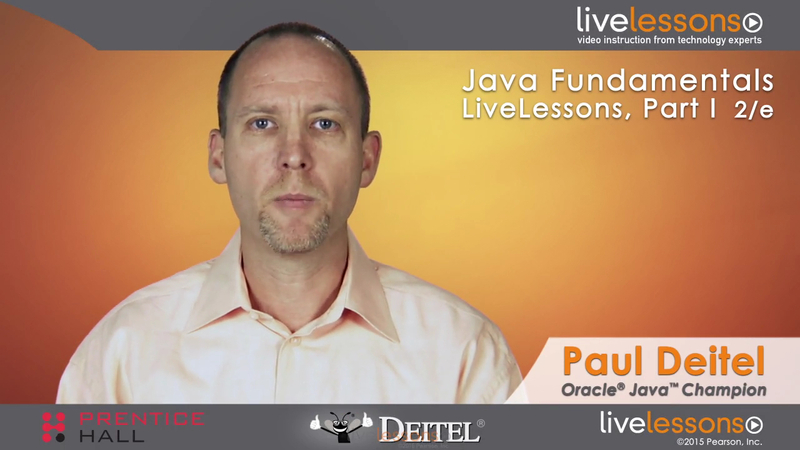 The LiveLesson features hundreds of complete Java™ programs with thousands of lines of proven Java™ code, and hundreds of tips that will help you build robust applications. Start with an introduction to Java™ using an early classes and objects approach, then rapidly move on to more advanced topics, including GUI, graphics, exception handling, lambdas, streams, functional interfaces, object serialization, concurrency, generics, generic collections, JDBC™ and more. You’ll enjoy Deitels’ classic treatment of object-oriented programming and the object-oriented design ATM case study, including a complete Java™ implementation. When you’re finished, you’ll have everything you need to build industrial-strength object-oriented Java™ SE 7 and SE 8 applications. • Industrial-Strength, Object-Oriented Design ATM Case Study and more. Download the source code associated with this LiveLesson.